It's Mickey Mouse, a classic addition to your ornament collection. Figural ornament features high-quality resin craftsmanship with beautifully detailed paintwork. 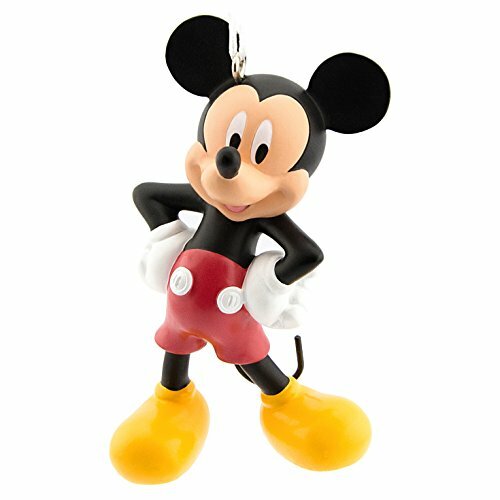 Perfect gift ornament for fans of Disney Junior's Mickey Mouse. This Hallmark ornament measures approximately 3" high by 2" wide by 1.5 inches deep. The gift box measures 5" high by 3.5" wide by 2.5" deep. Sizes vary slightly by design. The ornament comes ready to hang on your tree with an attached satin ribbon hanger. Each piece includes one Hallmark Disney Mickey Mouse Clubhouse Junior Holiday Ornament in a gift box. Hallmark ornaments are an easy, fun way to bring extra magic to your holiday decor. Hallmark's selection of ornaments are ready for all celebrations from traditional holidays to special occasions. This Hallmark original ornament features high-quality craftsmanship. The ornament is lead-free and made for years of celebrations.